Banks have raised Vijay Mallya, a drunkard who foiled and flee abroad, is one day annoying news. A new news item has been added to this list. Mallya's Rs 35 crore advance to BJP The news that the payments have been paid to the social networking sites. 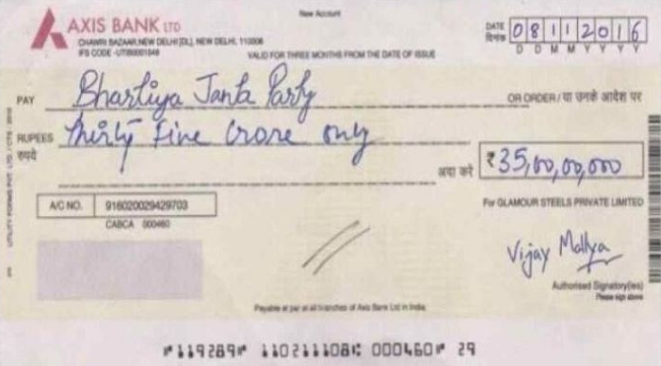 This is a photo of a check in the photo watts and Vijay Mallya has signed Rs 35 crore. This is a valid check. But this is a duplicate check that has been scrutinized. As a matter of fact, the check is the Bharatiya Janata Party instead of the Bharatiya Janta Party. Vijay Mallya's signature on the check is also proven. And the date at check is also a testimony to a fake check. The check was entitled 8-11-2016 and Mallya left the country on March 2, 2016.